Whenever you are changing the web hosting from one host to another, you have to change old domain DNS records necessarily as the old values will be obsolete. When you change your domain’s DNS from parent domain registrar to another hosting, your new records will be in effect after a certain time. This is called DNS propagation where the change in DNS records upon a change in the host is updated. The DNS propagation is dependent on your ISP and many other factors. Before updating the contents of your website, you must verify if DNS propagation has been implemented or not on your domain. Although it might appear like a cumbersome task, it is pretty easy with some free tools that help you check DNS propagation. Here are 14 Websites to check DNS spread of your website. View DNS shows the IP address from the places it collects data. You can check the DNS spread of up to 19 servers. You just have to enter the domain name and wait for the results. It shows much useful information such as the IP history checking, domain whois, traceroute, abuse contact lookup DNS report, Site up or down, ASN lookup, IP location finder, reverse DNS lookup, MAC address lookup, Ping testing, and much more. Different versions such as Developer, Professional, Business, Enterprise, are available at a paid price where you can enter more queries, and they will be answered. This is yet another DNS propagation checking tool with which you can fetch records around the world using the 21 servers that function globally. It has a very intuitive interface where the results are shown in the locations marked on the world map so that you can easily comprehend the data. You can search in the search bar given on the website, and the results start appearing once you hit the search button. Ceipam is a free DNS checker tool that comes from Camscape. You can check the DNS propagation with up to 17 servers with record names A, MX, NS, SPF, and TXT. You have to enter the hostname and record type. You can also choose the Nameservers to be queried. DNS Lookup checks DNS records associated with many name servers such as Google, OpenDNS, RDS, Vodafone, UPC, NTT, Hostnet and others. DNS Checker checks record from over 24 location servers. You can check names with A, AAAA, CNAME, MX, NS, SOA, PTR and TXT records. DNS Checker shows the results marked on a world map with red and green color codes to show if DNS propagation was successful at a particular place or not. DNS Sniffer is easy to use web site that is an excellent DNS propagation checker tool. You can check domain DNS records and much other useful information like NS, A, AAAA and WWW records. Added to this, there are other utilities like MX Lookup, Email test, Blacklist Lookup, IP location finder, Whois, Heartbleed, Ping test and much more. DNS Sniffer app is also available on Google Play. Nexcess shows the DNS Propagation results including the OP addresses of the servers from which it has received the information. You can check DNS Propagation of up to 22 servers worldwide. It also shows other information like A, AAAA, MX, TXT and SOA records of any checked website. Site24x7 is a DNS propagation checker tools with a lot of other added utilities. You can test the availability of a particular site globally. It assists you in checking details regarding the accessibility of your site for visitors and customers from around the globe. You can resolve IP address of your domain, monitor SSL connection and perform numerous other functionalities with this site. App Synthetic Monitor is a tool with which you can check DNS propagation of your site by using the information from up to 90 different stations worldwide. It shows the IP address of the users. With App Synthetic Monitor, you can find Ping, domain name server analysis and traceroute of a website. The domain name server analyzer is useful in finding CNAME and A records of any domain. It also shows the response time of your website globally. IntoDNS is a great tool to check your site configuration and DNS propagation. Also, it is useful to monitor the health of your site and gives suggestions on improving the health with references to protocols’ official documentation. You can obtain the Parent reports, NS, SOA, MX and WWW records with this tool. This is a very simple tool with a primitive interface to query a list of internet servers and check whether they return the information regarding the hostname you are looking for. You can use it to when the changes made on the DNS have been updated using this tool by entering the IP address. DNS Propagation Checker is a completely free and open source initiative. This website is a simple tool for the very necessary task of checking DNS propagation of websites. It attends to your query using a simple yes or no answer. You can also change the settings in such a way that it informs you by an email whenever your domain pointed to a particular IP address or not. All you have to do is enter the domain and IP address and wait. DNS Unlimited is a straightforward and powerful tool with great features with which you can check DNS zones look up of your website across the globe with the number of servers. You can use it to find A, AAAA, MX, and CNAME records for your and any site you want to know. The results of checked website from Public Recursive and Authoritative Servers with IP address are shown. This site is a fundamental one where you can find the necessary information about domains. You can monitor DNS zones of sites on multiple name servers around the world. It checks DNS records with four different servers globally from various places and also shows IP address of servers. MMX TOOLBOX is a great tool with a lot of additional features required for a DNS propagation tool. The website has 31 featured tools to check information of sites. It lets you diagnose SMTP mail server, Site health, DNS lookup, Reverse lookup, A, CNAME, AAAA, MX records and comes with many other features. You can also avail the PRO version services. 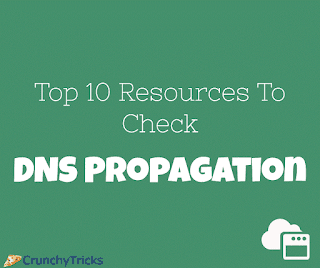 The DNS propagation checker tools will come handy if you recently configured domain from one host to another. Whenever a network has been modified, you must confirm DNS propagation without which whatever you post with the new domain will be invalid and not appearing on the website. So even if you just want to check records of any site, make the best use of the DNS propagation tools mentioned above.